We’d love your help. Let us know what’s wrong with this preview of Cuckoo in the Nest by Michelle Magorian. To ask other readers questions about Cuckoo in the Nest, please sign up. This review was originally posted on [Between My Lines]A Cuckoo in the Nest by Michelle Magorian tells the story of a family in post war 1940s England. Ralph's family is full of tension, of family members who no longer know or understand each other and the generation gap has never seemed greater. 'No suicides this week,' Aunt Win announced, laying the newspaper flat on the kitchen table. T This review was originally posted on [Between My Lines]A Cuckoo in the Nest by Michelle Magorian tells the story of a family in post war 1940s England. Ralph's family is full of tension, of family members who no longer know or understand each other and the generation gap has never seemed greater. This book captured my heart and this family of strong personalities drew me and held my attention until the very last page. Ralph wants to be an actor to his father's horror and despite every obstacle put in his way, he marches on doggedly towards his goal. Watching him fight and work like a dog to prove himself made me respect him so much. And the theatre scenes were authentic and engaging, I felt part of the inner circle and got a real insight into how it all worked. And I didn't just like Ralph, I felt like I got to understand every character in this family and they all felt real to me. There is an innocence and an uplifting feel to the book but it doesn't downplay either the struggle of all to find their way again after the war. There was a lot of misery and poverty and it could all have felt grim. But it didn't as there was a lot of unspoken love going around and it gave the book heart. All the characters are struggling to readjust to life after the war and all have changed during the war years. Ralph is out of step with the rest of his family as he spent the war years living with a Rector and has received a higher education than the rest of his family. His father is glad to be home from the front and to have his family all together again but the adjustment is hard for him. And it must have been a horrible anti-climax for so many families who would have dreamt for so long of happy family reunions and a world returning to normal but ended up facing with a very different reality. I really appreciated how the plot got dark and gritty as they all try to make sense of their new/old world. Overall I loved it. It had a lot more depth than I was expecting a Children's book to have and it quite honestly touched my heart. Who should read A Cuckoo's Nest by Michelle Magorian? I adored this book when I was little and re-read it over and over. I'd love to have another look at it now in adulthood to see whether the charm really endures but unfortunately I misplaced my copy years ago and never found it. As a child, stories of overcoming adversity through long and arduous struggles really appealed to me, especially if the protagonist was generally rejected by his or her peers (I really loved Tamora Pierce's Protector of the Small series for the same reason). I always found I adored this book when I was little and re-read it over and over. I'd love to have another look at it now in adulthood to see whether the charm really endures but unfortunately I misplaced my copy years ago and never found it. As a child, stories of overcoming adversity through long and arduous struggles really appealed to me, especially if the protagonist was generally rejected by his or her peers (I really loved Tamora Pierce's Protector of the Small series for the same reason). I always found it satisfying to see a character develop the skills they needed over a realistic period of time, rather than instantly gaining super powers or popularity. This book has all those things in spades, with an added little splash of romance, family drama and a time and place that I found interesting (post-war London, lots of rubble and fog), so I guess it pushed all my buttons at the time. I'm not sure it would be quite so interesting for me now, when I'm more interested in stories about the action of grace (or the devastating consequences of its absence/rejection). In hindsight, it is curious that God and religion don't feature at all in the characters' lives (as far as I remember). Was working class culture already that secular in post-war London? ETA: Ahhhh I'm a moron, I only just remembered that there's a load of stuff in it about them going to church as a family and which service Ralph (the main character) prefers and it plays into the tension between him and his father that he doesn't go with the rest of the family... I still can't remember though whether Ralph's faith plays any role in his decisions or seems to affect him particularly strongly. All the more reason to re-read, if I can find it. Thoroughly enjoyed this tale. Found it far more satisfying and more well rounded than Goodnight Mister Tom....for which the author is famous. It’s certainly apparent that Michelle Magorian has first hand knowledge of the theatrical world. I learnt so much about repertory companies.....including the attitudes different “classes” had to them in this era (set in England, 1946-1947). Magorian’s excellent descriptions of the bleak weather, lack of heating and electricity made me very glad to be living Thoroughly enjoyed this tale. Found it far more satisfying and more well rounded than Goodnight Mister Tom....for which the author is famous. Magorian’s excellent descriptions of the bleak weather, lack of heating and electricity made me very glad to be living with my current day home comforts. Moderately interesting and entertaining but the rather thin plot felt stretched by the addition of too many very minor, thinly-drawn characters and excessive detail about theatrical stage management. Strangely familiar ... all the way while I was reading this I felt I'd read it before. So strange. Entertaining novel with themes of second world war and the world of the theatre. I don't know. On the one hand - this topic has been done to death. On the other hand, this book is charming enough to get away with it. You follow this caricature of a person that longs to be in the theater, performing but keeps stumbling onto road blocks past which he has to find a way. Living in a poor family with an abusive father and a gullible mother, this books still manages to feel convoluted and contains aspects that are just ... meaningless. That don't add anything of value, but you stil I don't know. On the one hand - this topic has been done to death. On the other hand, this book is charming enough to get away with it. You follow this caricature of a person that longs to be in the theater, performing but keeps stumbling onto road blocks past which he has to find a way. Living in a poor family with an abusive father and a gullible mother, this books still manages to feel convoluted and contains aspects that are just ... meaningless. That don't add anything of value, but you still have to read through them to get to the good stuff. However it's the relationship between the main characters that makes this book shine and that lets me forgive and forget its other flaws. The insanely charismatic cast makes you want to keep turning those pages to see what happens to them next. And even when it doesn't make sense, the fact that the main character is just a cartoon version of himself makes it that much easier to swallow. When I read this at fourteen I couldn't put it down; I was completely enthralled. Re-reading the book over a decade later and it's not the riveting read I remember, but there's certainly enough there to keep it interesting. 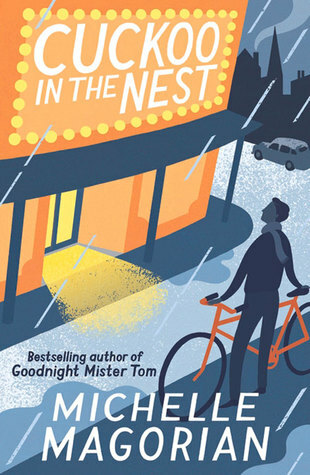 Whilst the main plot of the novel is centered upon Ralph's aspirations for the theatre, there are a myriad of sub plots exploring family relationships, politics within the workplace, and the constraints associated with class. Far from being a novel revolving around one lead p When I read this at fourteen I couldn't put it down; I was completely enthralled. Re-reading the book over a decade later and it's not the riveting read I remember, but there's certainly enough there to keep it interesting. Whilst the main plot of the novel is centered upon Ralph's aspirations for the theatre, there are a myriad of sub plots exploring family relationships, politics within the workplace, and the constraints associated with class. Far from being a novel revolving around one lead protagonist. the pages are packed with characters who each have their own struggles and their own challenge to piece together their lives after the war; each character brings a new dimension, and a more emotional element, to the tale. I loved this book and was fortunate to be able to finish it in two sittings. It reminded me a little of Billy Elliot, but the passion was acting not dancing. It was interesting how the characters changed through the story, I enjoyed Goodnight Mr Tom by Magorian, and she didn't let me down in this book either. Cripes. I'd forgotten how grim the post war years were. I remember my mum saying that her abiding child hood memory of the war and years after was the constant hunger. The book rang true according to her. My dad was called a pansy once while on a bus because he was wearing a yellow scarf ! Not as good as "Goodnight, Mr. Tom", but still enjoyable. The author must have been really interested in the theatre because 3 of her books so far have had the theatre playing a big part in the main character's make-up. The research, though and the time of her books' settings really make the books, and her characters are believeable, and you want to know them. I quite enjoyed this book, and it was especially germane to me as I just finished performing in a play (the first I've been involved in since a small production in grade 8). Magorian is very apt at creating likeable, multi-dimensional characters. I always enjoy reading this book, it's a story about adjusting to life after the war and family dynamics for an older son when his father is back. It's also about fighting for what you love, even if it's not what your family thinks is right for you. A story not just about the theatre and class division - but about, as a powerful sub-theme, the struggles of a man who has lived through the second world war and come home to find that life has changed in ways that he finds difficult to cope with. Recommended to Ria by: Sister, Peta. A really brilliant book telling of life just after the war and of the dedication of the character to follow his calling in life by pursuing a career in theatre in spite of opposition by family and society. I enjoyed reading this book. It started off a bit slow, but then you really get into the story! Michelle Magorian's style is also very likable and she writes in a way that appeals to younger readers. One of those books that just makes you happy. Lovely and interesting. Just wow. I've never read a book more honest, about theatre and how much hard work it is - not only being there, but getting there, and what people will think of you if you do. Just fab. I FINISHED IT! I have to admit it was better than I thought - yet I still don't understand the reason for the title completely. Oh well.